My American Legion Post, Calaveras Post 376, here in tiny Glencoe bought my wife and I a night's stay with dinner and even a bottle of champagne sent to our room at the Carson Valley Inn in Minden, Nevada. We left on Monday morning and returned Tuesday night. Since the Carson Valley is only about two hours from our home here in the Sierra foothills, it was great to get away and take a run over the Sierras and into Nevada. While the smoke from all of the forest fires was horrible, it was great to get away. My wife is a great sport and she doesn't mind hitting the Old West museums and historical sites to help me find more stories for my blog. My Deanna is a wonderful gal. She's way too good for me. She treats me wonderful and I've been blessed to have her in my life. Once out there, we decided to run over to Virginia City to check out that old town. I've been there many times over the years, and these days I find the town even more interesting to visit with my wife. While there, I went on a search for a very small museum that I absolutely loved many years ago. It had all sorts of interesting artifacts on display. And since I couldn't find it the last few times out there, I was really hoping that the owners may have reopened it. They didn't. It's no longer around and I found out that the owner auctioned off everything in there. Among the fascinating things in that museum was a horseshoe with a story attached to it. It was called the Padre's shoe because it was a horseshoe with a Christian cross as its heartbar. The story behind it is that the horseshoe was specially made for Catholic priests and padres in the days of the Spanish Missions. The idea behind it was that bandits would see that they tracks it left had a cross in them. That would indicate that the rider was a priest or a padre. It's said that because of the cross, bandits would leave the padre alone and not rob him. As with anything we read in a museum, we can believe this or not while hoping that the information is factual. There are a lot of great stories out there sitting in tiny museums. It's sort of like the story of the "Outhouse Pistol" that I also saw in that same little museum in Virginia City. It was there in a glass case that I saw a small pocket pistol as pitted and rusted solid as can be. Frankly, it looked as if it has been unearthed yesterday from some swamp that had dried up. The story goes that a young man shot and killed someone important in Virginia City. The young man ran for his life because close behind him was a mob with a rope. The mob at one point lost him, but then found him. The young shooter hid out in an outhouse. He didn't know what to do with his pistol so he threw the pistol down the hole. After they got him out of the outhouse, they could find a weapon on him. Some figured that he threw it in the hole but no one wanted to go after it, even though it was the murder weapon. No, no one would go after the pistol. And because they couldn't produce the gun, at least that's what the story said, the people decided that they couldn't prove that he was the shooter. They theorized that they too would start running if any of them saw a lynch mob with a rope coming after them. So no, just his running away didn't make him a killer. Besides, the young man is said to have started confessing to all sorts of petty crimes that he thought they had found out. That was supposedly why he ran when he saw them coming after him. So instead of hanging him, as the story goes, they banished him from the town. It's said there were those who questioned if he did it or not? There were those who wondered if they had banished someone who really should have been hanged? Of course, no one knew the answers to those questions because there were no witnesses and they didn't have the gun. Some didn't believe that there ever was a gun thrown down that hole in that outhouse. Those folks believed that they could have lynched the wrong man. Years later, long after that old outhouse had been moved, the ground had dried up. Many who were there during the murder were still around, though old and gray. While digging in the area for some reason, workers found the pistol. Of course, immediately many of the old timers swore up and down that they knew it was there all along. I saw the outhouse pistol in that small museum that's no longer there. 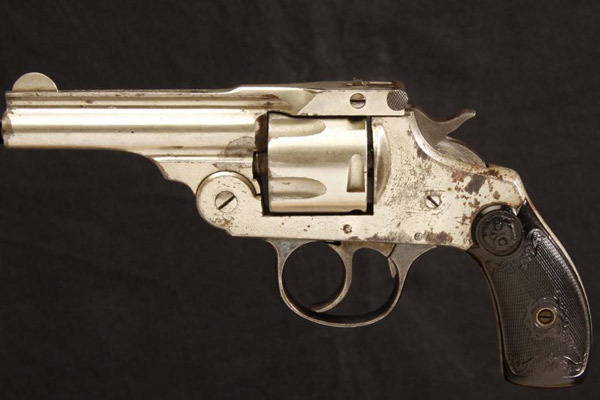 And while I can't remember if the small pocket pistol was an Inver Johnson or not, it did look like the one below which is. Except, it looked as though it had been recently dug up, rusted, corroded, completely useless after years in the "ground." 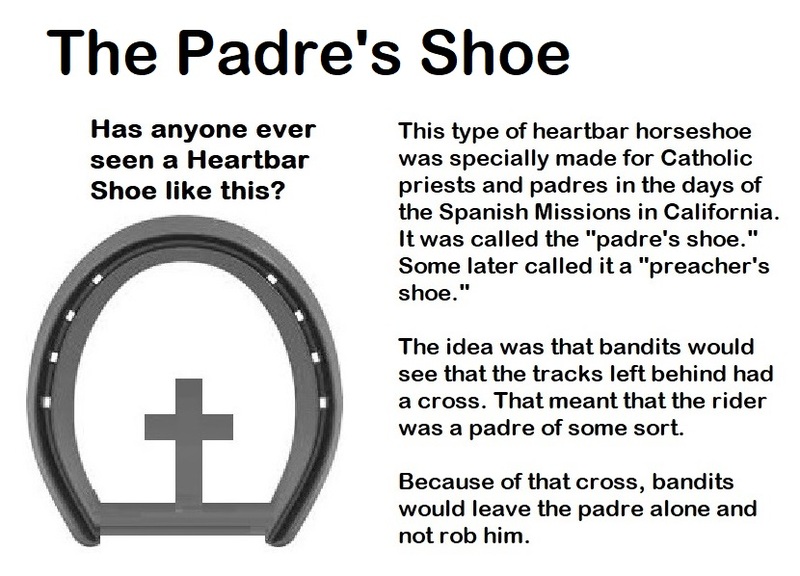 As for the "Padre's shoe," after posting a picture of what I remember it looking like, a reader said she couldn't find it when she used Goggle to search for such a heartbar horseshoe. She wanted to know my source. As with many of the stories that I've written about, my interest has been sparked after seeing something in a museum, seeing something at some historical site, reading about something in an old newspaper. Some things get me thinking about the rest of the story, the story behind what I've found. Other things make me wonder if the person writing about this or that was in reality a fiction writer, and I start researching to find out what I can about what really took place. My source for the Padre's shoe, a horseshoe with a Christian cross as a heartbar, came from that small museum in Virginia City. While it is no longer there, that's where I saw that heartbar horseshoe and read about it so many years ago. Frankly, I can't remember if the shoe was for a horse or a donkey, or meant for already traveled roads. I went looking for it so that I could take a picture of it so that you could see it for yourself. It's a shame that the museum is no longer there. Like you, I've seen a lot of horseshoes with bars and heartbars, but I've never seen one like the one that I saw in that museum. And maybe that's the point, like the story of the outhouse pistol, maybe it's because I'd never heard of such a story that it sticks with me. Elizabeth L. Johnson said, Neat post! Like the tidbits of history; very special!! !